General Thomas Sarsfield Power, was commander in chief of the Strategic Air Command, and was an active military flier for more than 30 years and has a wide background of command in the U.S. Air Force. Born in New York City in 1905, General Power attended Barnard Preparatory School, New York, entered the Air Corps flying school February 17, 1928, and was commissioned a second lieutenant in February 1929. His early service included assignments at most of the famed Air Corps fields of the day - Chanute, Illinois, as a student officer; Langley, Virginia, as commanding officer of the 2d Wing Headquarters Detachment; Bolling, Washington, D.C., for duty as an Army air mail operations pilot; Randolph, Texas, as a flying instructor; Maxwell, Alabama, to attend the Air Tactical School, and completing his well-rounded early career as engineering and armament officer at Nichols Field, Philippines. During World War II, General Power first saw combat flying B-24 missions with the 304th Bomb Wing in North Africa and Italy. Returning to the United States in August 1944, the general was named commander of the 314th Bomb Wing (Very Heavy) and moved his B-29s to Guam as part of the 21st Bomber Command. From Guam, General Power led and directed the first large-scale fire bomb raid on Tokyo, Japan, on March 9, 1945. On August 1, 1945, General Carl Spaatz, then commanding general of the U.S. Strategic Air Forces in the Pacific, moved General Power up on his staff as deputy chief of operations. He served in this capacity during the atomic bomb attacks on Hiroshima and Nagasaki. During the "Crossroads" atomic bomb tests at Bikini Atoll in 1946, General Power was assigned as assistant deputy task force commander for air on Admiral Blandy's staff. Then came assignments as deputy assistant chief of air staff for operations in Washington, and a period of air attache duty in London, prior to his transfer to the Strategic Air Command as vice commander in 1948. During the next six years, General Power assisted General Curtis E. LeMay, then commander in chief of the Strategic Air Command, in making SAC the world's greatest deterrent force. Then came his appointment as commander of the Air Research and Development Command in 1954, a position General Power held for three years. When General LeMay was named vice chief of staff of the Air Force in 1957, General Power became commander in chief of SAC and was promoted to four-star rank. General Power has been awarded the Distinguished Service Medal, Silver Star, Legion of Merit with oak leaf cluster, Distinguished Flying Cross, Bronze Star Medal, Air Medal with oak leaf cluster, Commendation Ribbon with oak leaf cluster, and the French Croix de Guerre with Palm. He is a rated command pilot and aircraft observer. 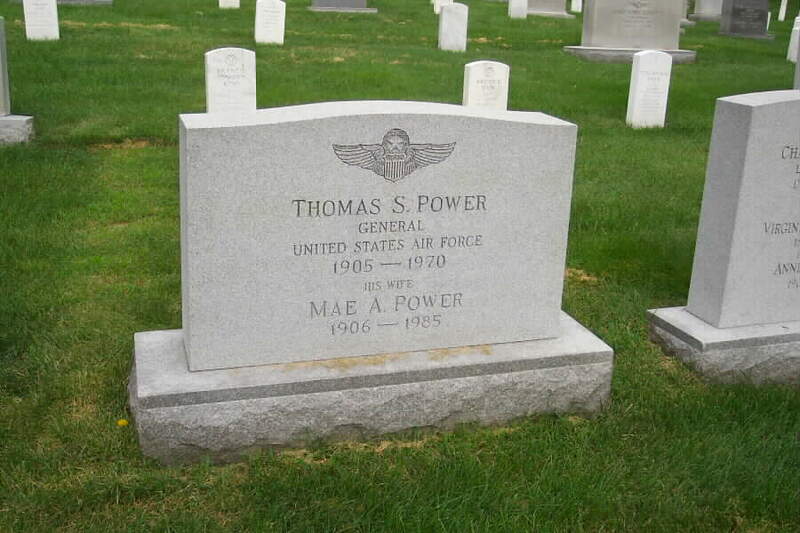 General Power was buried with full military honors in Section 30, Grave 396, Arlington National Cemetery. His wife, May Ayres Power (1906-1985), who he married on April 3, 1936, is buried with him.